Ram Gopal Varma's Hate-Love relationship with Mega Heroes continues. He might be coming all guns blazing at them on one day. The very next day, He appears as a self-proclaimed fan of Megastar or Powerstar. And now, Varma shares an on-location still featuring Megastar from the project which has been shelved and wrote: 'One of my fondest memories of all time'. Actually, Chiranjeevi & RGV planned a movie together. Ashwini Dutt bankrolled this project on Vyjayanti Movie s banner. Chiru and Urmila even shot a song for this movie. Ramu left the shoot halfway to fulfill his commitment given to Sanjay Dutt and that's how the film got shelved. 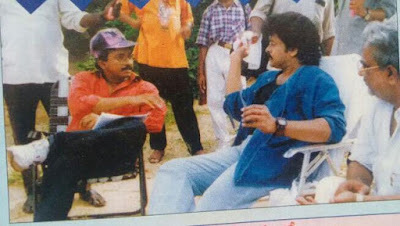 In the above still, Varma was seen explaining a scene to RGV and Chiru is paying attention to what the filmmaker is saying. Today, RGV turned an year older. To all those who wished him a great birthday, The filmmaker told that he is having a miserable day because of becoming one year older.